This Nativity set from Zimbabwe was made by John Chonyoni. He lives in a rural area near Rusape, about 200 miles from Harare, the capital of Zimbabwe. John’s entire family is involved in making the pieces: chopping the jacaranda tree, carving, sanding, etc. 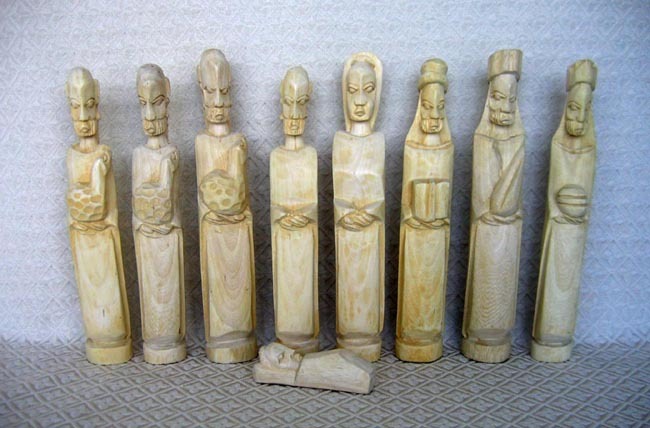 The set includes nine pieces hand-carved from Jacaranda wood: Joseph, Mary, baby Jesus in a manger, three wise men, and three shepherds each holding a lamb. The set is unstained. The jacaranda tree is famous for its grain, quality, and beautiful purple flower when in bloom. Each figure is 10.5 inches tall.